Welcome to Sepia Scenes for the first week of April. 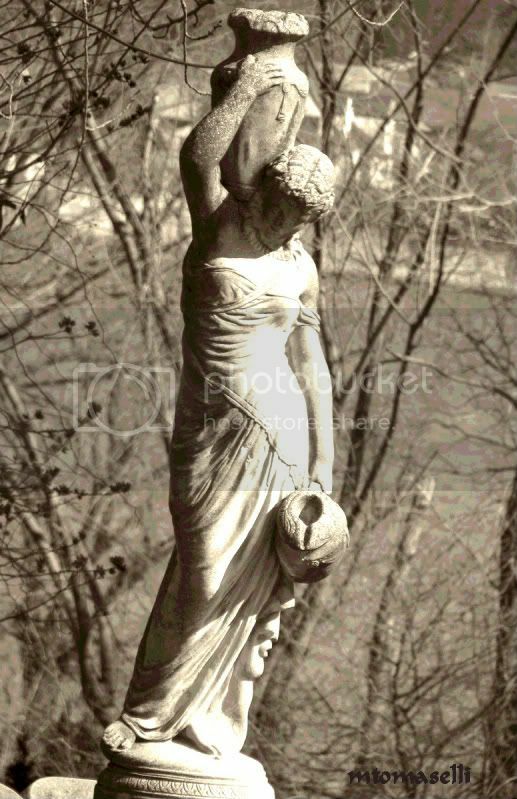 I found this classical sculpture in someone's front yard and when I considered it for a Sepia Scenes post I thought I would add to my sepia tone a little posterization. This is posterized at the level of 10. Most photo editing software provides for posterization. Why don't you give it a try? **I apologize for being late with Sepia Scenes. I'm still getting used to posting earlier than I usually do. This post is up now and will stay up through Thursday. Looks good and elegant in it's very own beauty. She is quite lovely, mary. I was intrigued by the background too trying to figure out what that was back there. If there is one thing that always look better in sepia, IMHO it is sculpture/statue. Great job. Now you sing,"Hey, hey Paula...(that's my name). I tell you, I would love to have her in my yard but on my current budget I don't think it would fit in with my other "yard art". I was gardening this morning and one of my brilliant ideas was to plant strawberries in the basket from a now defunct washing machine. I'm going to plant herbs or SOMETHING in the sides or else create an outer cover. Or else just let it be. Let me know if they ever put this statuary on Freecycle, I call dibs. What a magnificent statue, I love the light in this picture! Not knowing what the original looks like, but knowing what posterizing effects can do, I'd say you did quite the job here. And does using Mr. Linky make pre-scheduling impossible? Doesn't seem like it would, but having never used it I wouldn't know for sure. That would solve your problem of getting used to the new time at least. Interesting that you used posterization on it, Mary. It works well here...as does the sepia, of course! What graceful lines that statue has. The sepia and the posterizing really suit it - in fact, the posterizing didn't even register until you mentioned it. Oh I like Mojo's idea! Like the sepia toning, I will need to find more about the posterizing effects. The statue looks strait but the base looks slanted. Classical statues always have such a sense of romantic, elegant beauty! This one is stunning and love the effect you have created! Thanks a lot Mary for the memes and for your regular visits to my blog as well as kind comments. That's a beautiful sculpture, Mary. It looks quite nice in sepia. Classic! The statue looks like the saying 'classical antiquities'. Sepia adds the olde-world charm to this statue. The photo adds an aged grace to the figure. Quite nice! lovely statue and great job on the effects - i went with another lighthouse this week. I think I made it on time for this one. Love these statues you are posting! Statues are a perfect match for sepia scenes. I tried to posterize some of my photos and had great fun. Thank you for sharing this post. 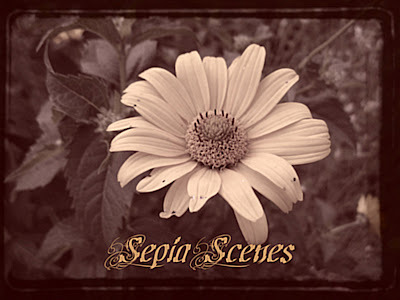 Happy sepia scenes, everyone :)! This photo worked out beautifully. The background melts away as the statue maintains her importance. Great shot. Lovely statue Mary -- and a great effect on it too! A beautiful statue. Love the lighting on her right side and it looks striking in sepia. I have mine up now. What a beautifully composed photo, and the statue looks lovely in sepia. I love your photos of the statues! They are so pretty! The Sepia just adds more beauty to them. Mine is posted. Have a great day!! I hope mine counts. I didn't photo shop it and make it sepia, it's just the natural tones of the desert which is where sepia tones must have originated. Anyway, I live surrounded by sepia! Here’s my sepia scene happy Friday! I get so excited to sign Mr Linky that I forget to leave my comment each week until I have made some visits! The statue looks so beautiful in sepia Mary. I am quite convinced it was never meant to be photographed in colour! Lovely work! I was on PJ's site and he highlighted your photos so I clicked and entered your world of sepia. You have some amazing sepia photos.